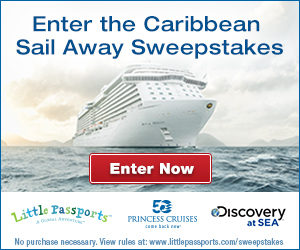 Little Passports, which sells a fantastic monthly subscription service for kids, has partnered with Princess Cruises to sponsor a cruise giveaway with over $4500 in prizes, including a family cruise to the Caribbean! Also, five runners up will each win a $50 gift certificate to DiscoveryStore.com. Be sure to enter before June 30, 2015. No purchase is necessary to win, and making a purchase won’t increase your chances of winning a prize. The Caribbean Sale Away Sweepstakes runs from June 1, 2015 through June 30, 2015 at 11:00 p.m. PT. Giveaway open to legal residents of 50 United States plus D.C. who are 21 years of age or older at the time of entry. Void outside of the 50 United States and D.C. and where prohibited. Read the official rules, prize descriptions and odds disclosure here. Sponsored by Little Passports, 222 Sutter Street, Suite 750, San Francisco, CA 94108. This Handbag Was Crazy Easy for a Beginner to Sew!